From the arrival of the First Fleet in 1778, Australian horses were selectively bred for strength and stamina, reliability and versatility. Parent stock included Thoroughbred, Cape of Good Hope horses (of mainly Spanish descent), Arab, Timor and Mountain pony. The strongest were retained for breeding and despite their mixed origins they developed into a strong and handsome type. It was only 40 years after the first horses were brought to this country that the exportation of high quality horses began. The Waler (from New South Wales) was considered to be the finest cavalry horse in the world, winning International acclaim for its endurance, reliability and hardiness during the Indian Mutiny, the Boer war and the First World War. From this base the Australian Stock Horse has been further refined and developed using recognised outstanding sires of the day. Great foundation sires of the breed have been Saladin (1875-1890? ), Cecil (1899 - 1920?) and his son Radium (1918 - 1947), Medlow, Silvius and Bruce. More recently names like Rivoli, Commandant, Panzer, Midstream, Young Valais, Gibbergunyah, Bushfire and Deo Juvante, all Thoroughbreds, have exerted considerable influence and demand for these lines is very high. The Australian Stock Horse Society was formed in 1971 to preserve and promote this wonderful breed. Horses were classified into the studbook on the basis of type and breeding. The fourteen sires listed above were found by Peter Gower to be responsible for most of the bloodlines accepted into the Society Australia-wide. Most well-bred Australian Stock Horses will trace to one of these foundation sires. In recent years some Quarter Horse breeding has been used but this is unacceptable to purists who prefer to stay with established Thoroughbred lines. The price of introducing outside blood is hefty Society fees, thus ensuring breeders only bring in worthwhile horses. The Australian Stock Horse excels at polo, plus Australia's two unique horse sports, polocrosse and campdrafting. Because of its quick reflexes and ability to calm right down in an instant. Its natural sensitivity and responsiveness enables it to be a true snaffle bit horse for station work, hunting, and sporting events, and its boldness across country makes it ideal for eventing and endurance. Who can forget the incredible scenes of the stock horses in the film �The Man from Snowy River�? Above all the Australian Stock Horse has been selected for beauty, temperament and intelligence, ideal for hacking, dressage and family pleasure riding. The well known South Australian Stock Horse, Crown Law, represented Australia in World Championship and Olympic dressage, and several Australian show jumpers of Stock Horse breeding are representing us internationally. In recent years intense show ring competition has led to a dramatic increase in the depth and quality of breeding stock, and a friendly but professional approach to presentation and training. 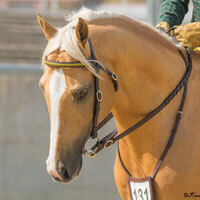 The Australian Stock Horse is tough but stylish and its popularity is growing daily. Top prices at auction regularly reach over $20,000 with average prices well in excess of $5000. We at Chalani hope that in visiting this site you will gain an insight into the Australian Stock Horse, Australia's most popular breed.